With six 660 MW generating units and a maximum capacity of 3,945 MW, producing around 24 TWh (86.4 petajoules) annually, Drax is the largest coal-fired power station in England (near Selby in North Yorkshire). 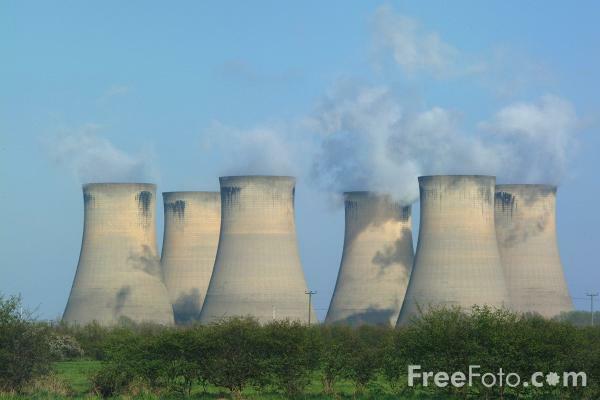 Cooling Towers, Drax Power Station, North Yorkshire, England. This work is licensed under a Creative Commons Attribution-Noncommercial-No Derivative Works 3.0 License. (Credit: Ian Britton via FreeFoto ). The biggest emitter of CO2 in Britain, Drax is the second largest coal-fired plant in Europe after Bełchatów, in Poland. This entry was posted on May 7, 2008 at 3:09 pm	and is filed under Climate Change, energy, environment, health. Tagged: Bełchatów Power Station, carbon dioxide, coal-fired, Cockenzie Power Station, drax, Edwardsport, Frimmersdorf power plant, Hazelwood Power Station, HR Milner Generating Station, Indiana, Niihamanishi, Poland, Porto Tolle, Prunéřov, UK, Yorkshire. You can follow any responses to this entry through the RSS 2.0 feed. You can leave a response, or trackback from your own site.